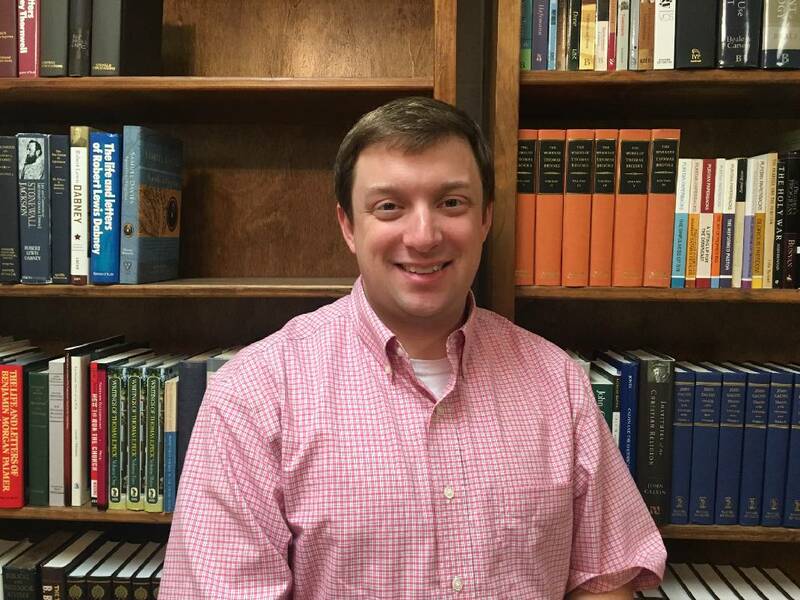 Ryan Biese will be installed as the new pastor of First Presbyterian Church of Fort Oglethorpe (PCA) in services at 6 p.m. Sunday. Biese comes to Fort Oglethorpe from five years as the pastor of First Presbyterian Church in Winona, Mississippi. He holds a bachelor’s degree from Grove City College in Pennsylvania and a Master of Divinity degree from Reformed Theological Seminary in Jackson, Mississippi. For the last four years, he has been an adjunct instructor in Bible and worldview at Belhaven University. His family includes wife, Ann, 4-year-old daughter Dabney and 1-year-old son Wells. “We are praying the Lord blesses his church through the ordinary means of grace — the word, sacraments, and prayer — as he reveals more of his mercies in Christ to us,” Biese said of his new appointment. He replaces Doyle Allen, who after serving as the pastor for seven years, left to become a military chaplain with the U.S. Navy, assigned to the Marine Corps. First Presbyterian Church of Fort Oglethorpe is at 1 Harker Road. For more information, call 706-866-2521.
' Veterans Day celebration: GraceWorks Church, 6445 Lee Highway, hosts tribute to the military and debut of "The Wonder of It All" CD by George Byrd, 3-4 p.m. Sunday. Free admission. 423-326-1651.
' Harvest Hymn Festival: Annual community concert of choral and congregational singing is at 4 p.m. Sunday at St. Timothy's Episcopal Church, 630 Mississippi Ave., Signal Mountain. A Mass choir will feature singers from St. Timothy's, Signal Crest United Methodist, Signal Mountain Presbyterian, Signal Mountain United Methodist and The Point Church at Signal. Free admission. 423-886-2281.
' The Perrys in concert: The Southern gospel quartet will perform at 6 p.m. Sunday at Friendship Baptist Church, 1005 Gadd Road in Hixson. Free admission.
' Holiday music: Two local groups will perform Wednesday in the Erlanger Medical Mall. Grace Notes, a flute, guitar and percussion trio, will play Thanksgiving music, hymns and selections from the 1930s-70s at 11:30 a.m. The 32-voice Chattanooga Christian School High School Choral Ensemble will perform at 12:30 p.m. in a show titled "Christmas Time Is Here." www.erlanger.org/artsaterlanger.
' Artist Series: St. Paul's Episcopal Church, 305 W. Seventh St., opens its 2018-19 Artist Series with award-winning virtuoso organist Aaron Tan, first-prize winner of the American Guild of Organists' 2018 National Young Artists Competition in Organ Performance. His concert is scheduled at 7:30 p.m. Friday. Admission is $10-$40 (discounts for groups). 423-266-8195, www.stpaulschatt.org.
' "The Spirit Soars": The Chattanooga Bach Choir will be joined by The King's Choir for this concert of a cappella sacred works for double choir, 7:30 p.m. Nov. 17 at Christ Church Episcopal, 663 Douglas St., and 4 p.m. Nov. 18 at St. Timothy's Episcopal, 630 Mississippi Ave., Signal Mountain. Admission is $25, free for students. Purchase in advance at www.chattanoogabachchoir.org or at the door.
' U-Church: Lee University's fall U-Church series concludes with "An Evening of Worship: Come to the Table" at 7:30 p.m. Nov. 18 in Conn Center. The theme of the student-led service is "Songs We Love To Sing," with a set list of favorites chosen by students in an Instagram poll. Communion is included. Admission is free; seating is first-come, first-served. Doors open at 6:30 p.m. Email jillbarnett@leeuniversity.edu to arrange free child care. For more information, email jlane@leeuniversity.edu.
' Let's Sing From Memory: Free social gatherings for those affected by Alzheimer's or other forms of dementia, along with their caregivers, to sing old songs and hymns that may reconnect them to old memories, are 1-2:30 p.m. first and third Tuesdays at Northside Presbyterian Church, 923 Mississippi Ave. Next is Nov. 20. 423-266-1766, http://northsidepresbyterian.org.
' Christmas Market: First Baptist Church of Lakeview, 10 Hudson St. in Rossville, Ga., will hold a Christmas Market 9 a.m.-3 p.m. Saturday to raise funds for Haitian missions. The day includes crafts, door prizes, silent auction and concessions including doughnuts, hot dogs, chips and drinks. Information: 423-488-2711.
' Bake sale/silent auction: Wauhatchie United Methodist Church, 3401 Cummings Highway, will host a bake sale and silent auction 9 a.m.-3 p.m. Saturday to raise funds for an upcoming Night To Shine event for individuals with special needs.
' Heavenly Homemade & Vendor Fair: The Women's Ministry of First Baptist Church of Fort Oglethorpe, 2645 LaFayette Road, will host a Heavenly Homemade & Vendor Fair in the fellowship hall 9 a.m.-4 p.m. Nov. 17. Items include homemade crafts, baked goods suitable for Thanksgiving and merchandise from local vendors. Proceeds support the Women's Ministry's Free To Be campaign and missions. Contact: Laura Jones, 423-605-1816.
' Rhythms Retreats: "A Rule of Life — Cultivating Your Own Sacred Rhythms," last in a series exploring spiritual practices to cultivate intimacy with Christ, nourish the soul and transform your life, is set for 9 a.m.-noon Saturday at Chattanooga House of Prayer, 3912 Dayton Blvd., Suite 200, Red Bank. The free session is led by Micki Ann Harris, ChattHOP's spiritual formation director. www.chatthop.org.
' Free Food & Movie Night: Community event is presented at 6 p.m. Saturday by Keith Baptist Church, 1573 Keith Road, Ringgold, Georgia. 706-450-0963.
' Men's Day: The Ark Church, 2200 Rawlings St. (formerly First Baptist of Lookout Mountain), will celebrate Men's Day at 11 a.m. Sunday with a service featuring the Rev. Kenneth Emanuel of Second Baptist Church in Jacksonville, Florida, as guest speaker. 423-771-7182.
' Scholarship program: Greater Tucker Missionary Baptist Church, 1115 N. Moore Road, will hold its 43rd annual E.P. Crutcher Scholarship awards program at 4 p.m. Sunday. Special guests will be the Male Chorus of First Baptist Church South Inglewood of Nashville. www.greatertuckerbaptistchurch.org.
' Festive Feasting: This vegetarian holiday cooking class will be presented 6-8 p.m. Monday by the Dinner With the Doctor Health Committee at Collegedale Seventh-day Adventist Church, 4829 College Drive East. Cooking demos will produce healthful, plant-based dishes to sample. Door prizes and recipe packets will be given out. Cost is $5. Registration closes Sunday. Call 423-430-9695.
' Campmeeting: Chris VanAllman Ministries presents the fourth annual "Experience the Rain" campmeeting Nov. 12-16, meeting at 7 CST nightly at Kimball Tabernacle of Praise, 1491 Battle Creek Road, South Pittsburg, Tennessee. Special guests include Pastor Tommy Bates, Pastor Michael Hill, evangelist Melvin Sanchez, Vessels of Joy, Vernon Greeson and Promise. Free admission. 423-802-4685, www.chrisvanallmanministries.com.
' Operation Gospel Justice: Chattanooga lawyers, local military advocates and area churches have launched this legal partnership to help the growing number of individuals who go without legal help because they cannot afford an attorney. A general legal clinic is set for 4:30-7:30 p.m. Wednesday at Ridgedale Baptist Church, 1831 Hickory Valley Road. Volunteer attorneys will be available to meet with individuals seeking help with any civil legal issue. Appointments are not necessary. More clinics are offered on third Saturdays at White Oak United Methodist Church, 2232 Lyndon Ave. Next is 9 a.m.-1 p.m. Nov. 17. Appointments are recommended for these sessions, though walk-ins will be accommodated. For more information, call 423-521-5410 or email Chattanooga@gji.org.
' 2nd Wednesdays at Second: Members and guests gather 6-7:15 p.m. second Wednesdays at Second Presbyterian Church, 700 Pine St., for a community meal and short program combining fun and faith. Meal cost is $6 per person, which includes drink and dessert. Parking is free after 6 p.m. in the lot off West Seventh St. behind the church. Enter through the back door.
' Fall revival: Keith Baptist Church, 1573 Keith Road in Ringgold, Georgia, hosts a five-night revival Nov. 14-18 with Jimmy McClure, pastor of North Georgia Baptist Church, preaching and Sacrifice singing. Services start at 7 p.m. Nov. 14-17 and 11 a.m. Nov. 18. 706-450-0963.
' SCWN after-hours: Scenic City Women's Network will host a "Fabulous '50s Christmas" after-hours event 6:30-8:30 p.m. Thursday at the Heritage Landing clubhouse, 1100 Heritage Landing Drive. Attire of the era is suggested for a night that includes photos with "Elvis" in a 1952 Mercury, '50s music by a DJ and Christmas music by the Sweet Adelines. Tickets are $20. Register by Tuesday at https://scwn.org.
' Chonda Pierce: The Christian comedian will perform 7-10 p.m. Friday at Abba's House, 5208 Hixson Pike. Special guest is Karyn Williams. Tickets are $27 general admission, $49.50 VIP, which includes early entry, meet-and-greet, merchandise discount; ticket discounts for groups of 10 or more. Find the link to purchase at www.abbashouse.com.
' Community Thanksgiving: Chattanooga Area Young People's Department of the African Methodist Episcopal Church will sponsor its 19th annual Thanksgiving community dinner at 1 p.m. Nov. 17 at St. Paul AME Church, 2514 Williams St. Nonperishables will be collected 9 a.m.-1 p.m. Sundays at the church (no government commodities) so that needy families may receive food baskets (names are being sought). Information: Ramona Pratt, 423-421-4688.
' Sanctuary rededication: Trinity Lutheran Church, 5001 Hixson Pike, hosts an open house to celebrate the completion of the sanctuary modernization project 10:30 a.m.-2 p.m. Nov. 17. A service of rededication will follow at 1 p.m. with Bishop Julian Gordy presiding. 423-870-1236.
' Gratefull Chattanooga: Causeway hosts this rebranded citywide Thanksgiving potluck (formerly One Table) 11:30 a.m.-1:30 p.m. on the Monday before Thanksgiving, Nov. 19, in the 200 block of East M.L. King Boulevard in front of the Bessie Smith Cultural Center. Free to eat, but bring a potluck offering in a disposable dish if you can. Volunteers needed for setup, food service and cleanup, or sponsor a plate ($10), chair ($25), dish ($50) or table ($100). causeway.org.
' Women's Bible study: "The Shepherd With Me," a study of Psalm 23 prepared by Jennifer Rothschild, is held 6:30-7:30 Wednesday nights at Hickory Valley Baptist Church, 2320 Hickory Valley Road. 423-892-1916.
' Habitat homeowners: Habitat for Humanity of Greater Chattanooga Area, a faith-based nonprofit that builds homes for those in need, is accepting applications from families and individuals interested in becoming Habitat homeowners. To obtain a prequalifying questionnaire, visit www.habichatt.org. or call 423-756-0507.
' Community Clothes Closet: Open 11 a.m.-2 p.m. Wednesdays at 1015 Laura St. across from Dodson Avenue Health Center. Free clothes and small household goods available; donations appreciated. Contact: R. Ludy at 423-933-6314.
' Siskin Museum of Religious Artifacts: Open 9 a.m.-4 p.m. Monday-Friday at Siskin Children's Institute, 1101 Carter St. The facility is home to more than 400 religious pieces (247 Judaic and 140 Christian), ranging from the 16th to 20th century. Other religions and philosophies represented include Islam, Buddhism, Hinduism and Confucianism. 423-648-1700, www.siskin.org.
' Kidz on the Rock: Groups for kids in kindergarten through sixth grade meet at 10:45 a.m. and 6 p.m. Sundays as well as 6:30 p.m. Wednesdays at White Oak Baptist Church, 301 Memorial Drive in Red Bank.
' Awana Clubs: Groups for children age 3 through sixth grade meet 6-7:30 p.m. Wednesdays at Hickory Valley Baptist Church, 2320 Hickory Valley Road. 423-892-1916.
' Exercise class: Northside Presbyterian Church, 923 Mississippi Ave., offers an exercise class focusing on strength, energy and balance 10:30-11:30 a.m. each Tuesday and Thursday. Open to all ages and skill levels. $5 per class. 423-266-1766.
' Recovery, a Christ-centered 12-step program for anyone struggling with addictive issues, compulsive behaviors, loss and life challenges, meets each Thursday at Ooltewah United Methodist Church, 6131 Relocation Way. Dinner at 5:30 p.m., worship at 6:15 p.m., open share groups at 7:30 p.m. Child care provided. 423-238-9216, oumclive.org/recovery.
' Brainerd Celebrate Recovery, a 12-step Christ-centered recovery ministry that focuses on healing hurts, habits and addictions, meets every Thursday at Brainerd Baptist Church's East Ridge campus, 1203 Blocker Lane. Dinner at 5:45 p.m., large group at 6:45 and small/open share groups following. Child care provided. 423-313-8888, brainerdbaptist.org/celebrate-recovery.
' Grief support: 5 p.m. every first Tuesday at Fort Oglethorpe United Methodist Church, 1733 Battlefield Parkway, Fort Oglethorpe, Ga. Presented by PruittHealth Hospice. Free. For more information, call 706-602-9546.
' Not Alone, a support group for family and friends of a loved one who is incarcerated, meets at 11 a.m. the fourth Saturday of each month at LaFayette Presbyterian Church, 107 N. Main St., LaFayette, Ga. Refreshments and child care are provided. To be included in Faith Briefs, send information to Life@timesfreepress.com. Listings must be sent by Wednesday morning each week.